Gabe Pressman: Commissioner, let’s talk about your Irish roots. What county did your parents come from? Commissioner Ray Kelly: Good question. My mother’s people came from Cavan and Longford and my father’s parents were from Roscommon, two well-known counties in the country. I’ve run into a lot of people who have come from all three counties since there was an announcement that I would be Grand Marshal, so they all have their own individual county events in the city. GP: Did any of them remember your ancestors? RK: I remember my mother's father. He lived with us for a short time when I was a young child, but that's the only grandparent I remember. He went from being a cop on the street to the commander of 30,000 police officers in New York. 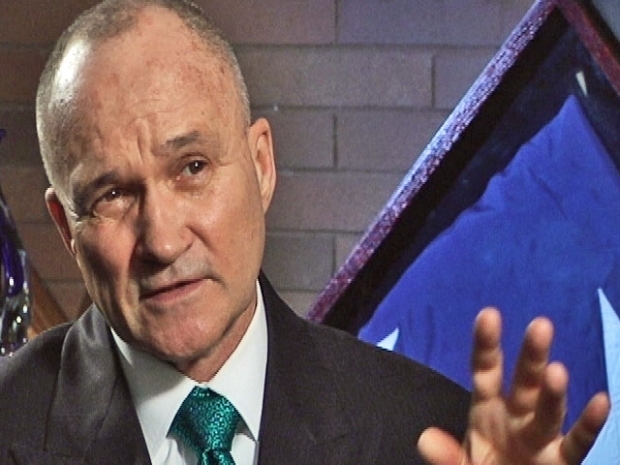 Amid all his past honors, being named Grand Marshal of the city's St. Patrick's Day Parade has a special meaning for police commissioner Ray Kelly. GP: Did you grow up with a sense of being Irish in your neighborhood in New York? RK: Not a particularly strong sense quite frankly, it was there but I think that somewhat unique to the Irish community, assimilation was one of the goals. My family was not too focused on that issue when I was growing up. My parents were born here, but I think the focus was clearly on doing everything you can to get an education and to use the tremendous benefits that we have in this country. GP: Do you think the Irish immigrants represent the typical immigrant experience? RK: Each group has its own uniqueness but in a general sense--yes, they do. The benefit that the Irish have is that they spoke English. They would come here and take civil service and government jobs, such as working in the Police Department. GP: You made a speech after 9/11, in which you pointed out the many Irish Americans working at the financial services firm Cantor-Fitzgerald. When many of them tried to get downstairs after the attack, there were Irish Americans from the NYPD and the Fire Department coming up the stairs to meet them and make rescues. Was this a very symbolic thing for you? RK: Yeah, I think there was a lot of symbolism there and it sort of sums up the Irish American experience--the financial services industry has been a vehicle for the Irish as they do well in this country. The two forces sort of met on the staircase. Police officers and fire fighters going up responding to the emergency and the Irish Americans among others of course leaving, escaping the danger as best they could. GP: Does that memory touch you deeply? RK: I think it’s symbolic of the Irish American experience in this country, particularly, the attraction of the emergency response forces for Irish Americans. GP: In the debris after the attack I understand were found many of those classic Irish wedding rings—the Claddagh ring—with two hands clasped holding a heart between them. It stands for Friendship, Loyalty, and Love. There’s irony in that isn’t there? GP: Have you visited Ireland? RK: I’ve been there twice. But I’ve never had an ability to go back to counties that I’ve mentioned, Roscommon, Cavan, and Longford. I was in Dublin and a little outside of Dublin on two visits but I was there on business. I’d love to back and spend more time and do a little exploration of my roots. RK: (smiles and shakes his head) That sums up an early experience for Irish Americans. GP: Does the tradition of the sentimental Irishmen live on? RK: I think it’s probably in the DNA and I think you’ll see it on March 17th. It’s usually exhibited in a more outward manner than other days, but there’s still always that touch of nostalgia, a little bit of melancholy, mixed in with partying. GP: You worked your way up from a cop on the beat to command more than 30,000 police officers of New York, you’ve been the head of the secret service and other government agencies. You’re a Vietnam veteran, a retired colonel. With all those past honors, what does being the grand marshal of this parade mean to you? RK: It is a position that of course is very symbolic. For any Irish American the St. Patrick’s Day Parade is sort of the culmination each year of the awareness and celebration of Irish heritage. I’ve spent probably the vast majority of St Patrick’s days of my adult life on 5th avenue, mostly as a police officer: policing the event in various ranks and then as a police commissioner marching in the parade. And now this is such a unique opportunity and such an honor to be the Grand Marshal. It’s just humbling to be included in the experience that is the 249th parade. That’s amazing. How many things last 249 years? I’m just very proud to have been selected. GP: Would your parents be very proud? RK: Oh sure, absolutely. They would have been ecstatic. GP: As a kid, do you remember ever seeing the parade? RK: I remember seeing the parade in college. But of course, most of my memories of the parade have to do with being a police officer. At the event, you know you get there early, and you stay late. Long days. Cold days often times. Rainy days, Snowy days, I remember all of that. But, this will be the best day for me. The best St. Patrick’s Day for me. GP: As you look back on your own history and the history of your dept, as great as your achievements have been, does being Grand Marshal for this parade still stands out? RK: Absolutely, it is a terrific honor and I’m very proud, my family is proud and as Irish Americans, as I say, it was always known as a very important event.